Refactoring a C++ code base for a binary API, I needed to deprecate some functions and communicate changes to API users. While noted in the API’s documentation, people don’t read documentation, so I wanted the compiler to warn users as well (not that people read compiler warnings either!). C++14 has a [[deprecated]] attribute, but what if you want to use that if supported, and do something else for other compilers? Macros to the rescue! Below will use the canonical C++14 way if supported, and an equivalent proprietary method for GCC and Microsoft Visual C++ respectively. The macro is not perfect, however (or rather, compilers are not). The canonical way for checking if[[deprecated]]is supported is with the compiler definition__has_cpp_attribute(deprecated); unfortunately, GCC 6.2 defines this symbol regardless of whether you are in C++14 mode or not. And then it prints a warning when run in-pedanticmode, even though it’s supported! This blog, my landing page, wiki, and a few of my other Websites are now being served encrypted over HTTPS (see the lock icon in your address bar? ), thanks to Let’s Encrypt. Along with TLS, I’ve enabled HTTP/2. Hackers won’t find anything sensitive on my public Websites, but my private Websites (e.g. my ownCloud and Tiny Tiny RSS instances) have needed more security for a long time. Enabling HTTP/2 was very easy, as HTTP/2 support is shipped with the ‘http2’ module in Apache 2.4.17 and later. While easy, it wasn’t obvious; I’ve written a tutorial for enabling HTTP/2 on Apache. Redirecting non-HTTP connections was trickier than I thought, so I’ve written a tutorial for HTTPS redirects with Apache’s mod_rewrite too. 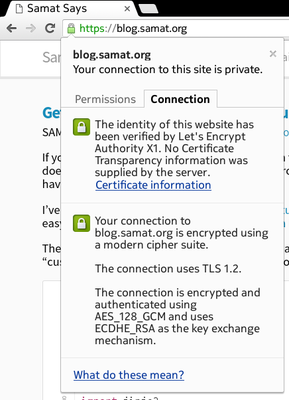 I created my TLS certificates as part of Let’s Encrypt’s closed beta. I have an unconventional and complex Apache setup (something I’ll simplify, one day…) and because of bug 1531, a problem in an upstream library, I can’t use the official client the way it was meant to be used (i.e. “install” or “auth” commands). I don’t think I wanted an automated script editing config files on my servers anyway. 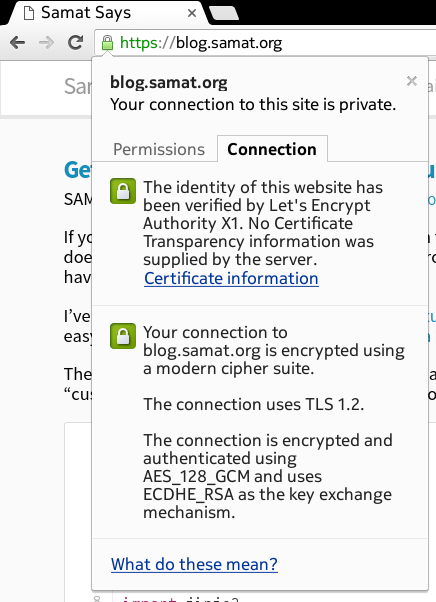 With a lot of fiddling, I’ve figured out how to use the official letsencrypt client reverse proxied through Apache, which will let me update certificates regularly without headache. Apache 2.4.17 ships with mod_http2. Available in Debian 9 (stretch) and Ubuntu 16.04 (Xenial Xerus) (see comments) Ubuntu 16.10 (Yakkety Yak), it brings HTTP/2 support to one of the Internet’s popular Web servers. Assuming you’ve already configured a SSL/TLS Website, this quick tutorial will show you how to quickly enable HTTP/2. Based on mod_h2, the module is still very experimental. It should be enabled manually, on a site-by-site basis, via the Protocols directive. The module’s defaults otherwise don’t need to be changed. and look for mentions of “http2”. While you’re fiddling with your Web server configuration, consider updating your SSL settings with Mozilla’s great SSL configuration generator. If you’re an organizer on Meetup.com, it’s a pain to look for events that have happened in the past in your group. Meetup doesn’t have a way to search only within your group, and paging through the calendar is a pain if your group is old or if you have a lot of events. I’ve written a quick Python script that uses Meetup.com’s API to get all of a Meetup group’s meetup events and generate an easy-to-search and view report. For the Jornada Hiking & Outdoors Club, you can see a report of all our previous events. The script is on Github as a gist if you’d to run it against your own Meetup.com groups. You’ll need to know the group’s “custom address” (which is also in the URL for your group) and have an Meetup.com API key. If you’ve found this blog post, downloading and running the script might be too much for you. Feel free to contact me with a link to your group and I’ll e-mail a list for your group. Raspbian is the definitive full-featured Linux distribution for the Raspberry Pi. As it is tailored for educational use, there is a lot of software that is unnecessary (i.e. bloat) if you intend to use your Pi headless. While various slimmed down Linux distributions exist for the Raspberry Pi, what if you want to slim down an existing Raspbian install? I encountered this problem when I hosted a Raspberry Pi with Raspberry Pi Colocation from PCextreme. You’ll get a Raspberry Pi with stock Raspbian, complete with X11 and a bunch of other software unnecessary for use in a datacenter. The above snippet is available in Github as a gist—I’ll keep it up to date, and feel free to fork it and add/remove whatever other packages you find necessary. The above backups up/etc/network/interfacesin case it’s deleted (see comments). Coming soon: how to create your own Raspbian image! UPDATE [19 Aug 2015]: Robert Ely pointed out that purging raspberrypi-ui-mods will delete your network config—I’ve updated the gist so this package is only removed, not purged. I’ve also added a line from Gareth Jones that will remove the configuration files for packages no longer installed. UPDATE [06 Jan 2015]: Raspbian now offers a “lite” image that won’t include a lot of this bloat. If you’re setting up a new Raspberry Pi, consider using that image. NOTE: If you’re using Raspbian 2015.01 or later, the Raspberry Pi kernel 3.18 now includes this driver—you don’t need to compile anything and this tutorial is now irrelevant! Raspberry Pi enthusiasts like to use Realtek 8188eu-based Wi-Fi adapters. Known as “micro” Wi-Fi adapters, they are small and inexpensive. For example, the TP-LINK WN725N V2 can be found for under $20 (the V1 and V3 use different chipsets. Thanks for making everything confusing, TP-LINK!). As of October 2014 and Linux 3.12.29+, the driver for this Wi-Fi adapter isn’t available in the Raspberry Pi Linux kernel, so these Wi-Fi adapters are not supported out-of-the-box, despite otherwise you may find on the Internet. Definitely, they don’t work in a plug-and-play manner. You can get these adapters to work by using an out-of-tree driver (i.e. a driver not included with the Linux kernel). People on the Internet have resorted to doing all these silly things like downloading random kernel modules or compiling the vendor Linux kernel trees from scratch trying to get this driver to work. You’re probably reading this article because you, like me, thought it was silly to chase files around on some random Internet forum. The source code for the 8188eu driver is available on GitHub. Rather than trying to look for random files and hope they work, you can keep the source for the module on your Raspberry Pi and recompile the module as needed. Below are copy-and-pastable instructions to do this on Raspbian. Make sure you have a compiler, etc installed. Download the source code for the driver. I prefer to put source code for stuff like this somewhere convenient in my home directory, like ~/src/drivers/. Your Wi-Fi should be working, though you’ll need to configure it (configuring it is out of scope for this article). The above is all you need to turn your Raspberry Pi into a working Wi-Fi client. If you want to use your shiny new Wi-Fi enabled Raspberry Pi as an access point, there’s a gotcha with Realtek Wi-Fi adapters (I’ve found this true of both the 8188eu and 8192cu chips): they won’t work with hostapd as included with Raspbian or Arch Linux. You’ll need to use a custom hostapd, such as this one posted by Jens Segers, to get a working access point. If you’re on a metered Internet connection (like me), downloading and re-downloading packages to setup your Python virtualenvs and Node.js projects isn’t very fun. Besides wasting data, it’s slow. These package managers actually have caching built-in, though it needs to be configured. Follow the instructions below to configure Python’s pip, Node.js’ NPM, and Twitter’s Bower. I assume you’re on Linux and want to use XDG-compliant directories. Configuring a cache directory for pip will cache both source and wheel-based packages. pip’s package cache caches things by URL, not by package, which makes pip’s caching mechanism not work with mirrors. The pip manual describes a mechanism for fast and local installs if this a problem for you. See NPM’s documentation for package caching for further detail. None of pip, npm, or bower do any purging of outdated or unused packages. You will have to manage this yourself, unless you are OK of these caches growing without bound (disk space is cheap these days). Attempting to manage these caches is tricky: since modern UNIXes no longer update last accessed times (aka atime) on files, you can’t purge packages on last use. I leave figuring out the best way to purge these directories as an exercise to the reader (please leave a comment!). I’m rebooting this blog. It’s a long time coming. My first “blog” was back in 2003. As was fashionable back then, I wrote my own, custom blogging software in PHP. In 2005, I ditched the custom software and started using Drupal, starting with Drupal 4.5. I become fairly skilled with Drupal: I wrote themes, modules, launched several Websites for myself and clients, ran a Drupal-oriented consulting firm and Web hosting company, and managed scalability at a startup built on Drupal. I, very painfully, upgraded those sites and this blog, which started with Drupal 4.5, all the way up to Drupal 7. It was not easy or fun. I had to constantly deal with security upgrades. Upgrading to new Drupal versions required a witch hunt to find which 3rd party modules were deprecated, which new modules I should use to replace them, and in what ways those modules worked differently. And then there was all the spam—even with Acquia’s Mollom service, too much spam got through, requiring constant moderation. The thing that did Drupal in for me was SA-CORE-2014-005, fixed in Drupal 7.32. After over 10 years of following Drupal security updates, I missed one, by just a few hours—and my site was hacked. While restoring from my backups, I made a mistake and deleted the most recent one. If I wasn’t turned off to PHP Web applications before, I’m really, really turned off to them now. After using Drupal for almost 10 years, I’m switching to something else (at least for my personal stuff). Because I didn’t want to deal with upgrading or security issues, it meant using something like Ghost or Wordpress was out. The new Samat Says is powered by Nikola, a static site generator. I looked at Jekyll, Blogofile, Pelican, but Nikola seemed the easiest for me to understand, extend, and most importantly has a vibrant, active community. For a long time, I cared about owning my comments and not being tied to a 3rd party service. After dealing with all the spam my old Drupal site received, I now care quite a bit less. I’d like to move to a self-hosted, or better yet federated, commenting solution in the future but for the time being I’m using Disqus. I haven’t figured out how I will migrate old comments yet. Worth mentioning: you may have noticed this isn’t an actual first post. I’m slowly migrating content from the old blog (probably only the popular bits) from my old Drupal installation over to this Nikola-powered one. Apparently, University of Florida thought this was a compliment. Forbes reports (via) that University of Florida has eliminated research & graduate work in its Computer Science department, while simultaneously significantly increasing funding for athletics. A clarification missing from the Forbes article: UF is eliminating research and graduate work in its computer science department, just like it did for its nuclear engineering department the year prior. The departments will remain as severely gimped teaching-only undergraduate departments… not unlike a glorified community college. Keep it real University of Florida!